By now readers should have a certain idea of what to expect from a comic about Lockjaw. He's a gigantic, teleporting dog with a habit of getting into wacky adventures when he isn't busy teleporting the Inhumans to and fro. Tonally, we're not exactly talking The Dark Knight Returns here. But while this new miniseries is every bit as goofy as one would expect, it also manages to weave in a surprising amount of emotional depth in the process. The truth is that writer Daniel Kibblesmith and artist Carlos Villa have basically crafted a stealth D-Man comic and disguised it as a Lockjaw book. Not that Lockjaw himself isn't a prominent fixture in this issue, but his own struggles are generally secondary to that of poor, beleaguered Dennis Dunphy. That swerve may disappoint readers hoping for a completely critter-focused comic in the vein of Pet Avengers. But a good story is a good story, and that's what Lockjaw delivers. 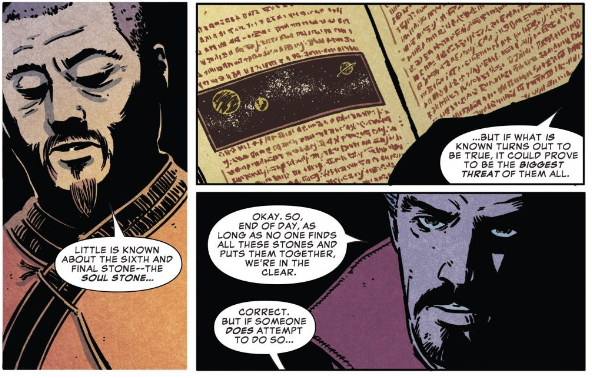 In the pages of Avengers: Infinity War Prelude #2, we learn a critical piece of information about the final Infinity Stone in the Marvel Cinematic Universe. Prior to David Bowie's untimely death, I would have happily paid money to see a new Labyrinth movie. But these days, not so much. At this point, better the saga be continued in another medium where Bowie's absence isn't so strongly felt. Labyrinth: Coronation successfully recaptures the tone of that film even as it steps back to examine the tragic origins of the man who grew to become Jareth the Goblin King. 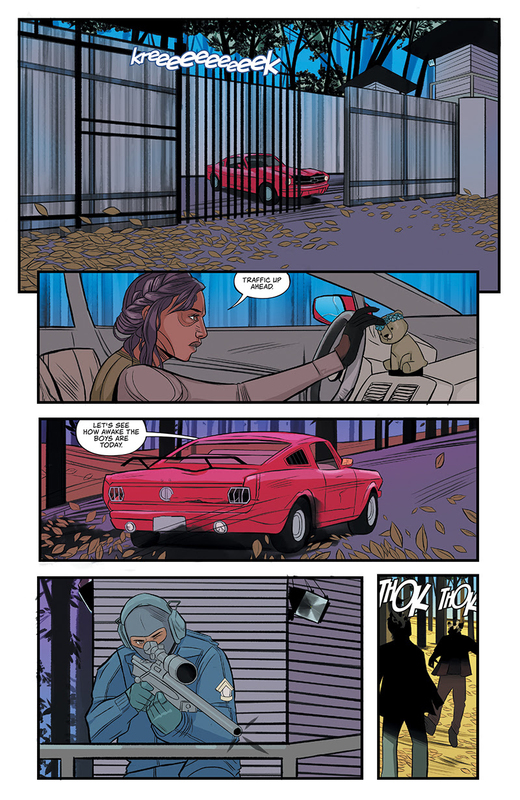 Writer Si Spurrier and artist Daniel Bayliss use the setting of the original movie as a framing device, with Jareth regaling baby Toby with a tale that quickly becomes obvious is his own origin story. The result is a Labyrinth prequel that takes place as much in the real world as the Labyrinth itself (for now, at least). That might sound like a questionable storytelling decision, but it works. It helps that the real world portions are set in 18th Century Vienna, so there's still an air of the fantastical and ostentatious to the narrative. The Wilds, the new zombie apocalypse comic from Black Mask Studios, has a very big twist: instead of decaying shamblers, or fast-moving infected, the zombies in The Wilds have become host to flowers. How these Abominations, as they’re called in the comic, actually work isn’t explained in the first issue. Instead we learn about the chaotic early days of the new plague and the new world that’s grown in its wreckage. The flower zombie Abominations have taken over the countryside, with humanity having retreated into armed compounds and walled towns. Only Runners travel safely between communities, delivering supplies, messages, and occasionally people. The Abominations are so good a concept and their world so quickly and thoroughly established in The Wilds #1 that you’ll be willing to wait for that explanation while you get to know runner Daisy, her girlfriend Heather and the rest of the cast in this most unusual zombie apocalypse story. 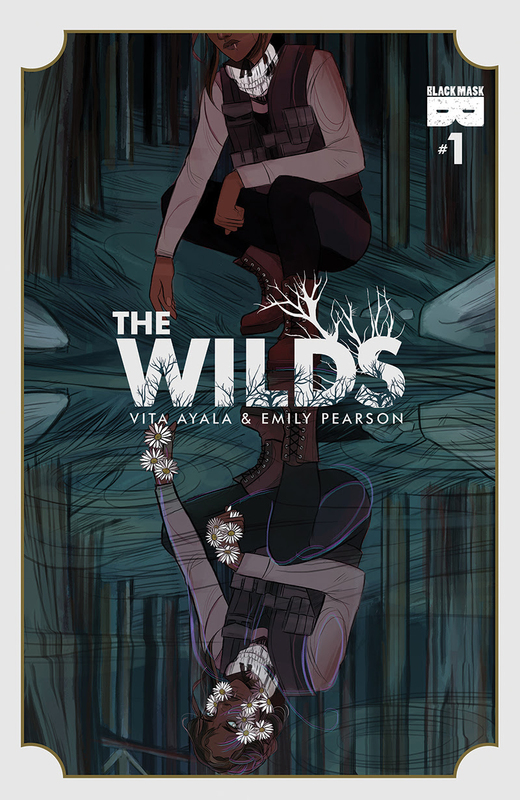 CBR caught up with the full Wilds crew — writer Vita Ayala, penciler Emily Pearson, colorist Marissa Louise, letterer Jim Campbell, cover artist Natasha Alterici, and editor Danny Lore — to talk flower zombies, apocalypse fiction, and how they put this book together. CBR: How did you get involved with The Wilds and why did you decide to work on this book? Emily Pearson: Vita and I were looking for a story to do together, and we went over a few ideas that might be fun to do. The Wilds really stood out to me the most, and we starting working on the book and developing it from there. There’s a lot about The Wilds that’s appealing to me. 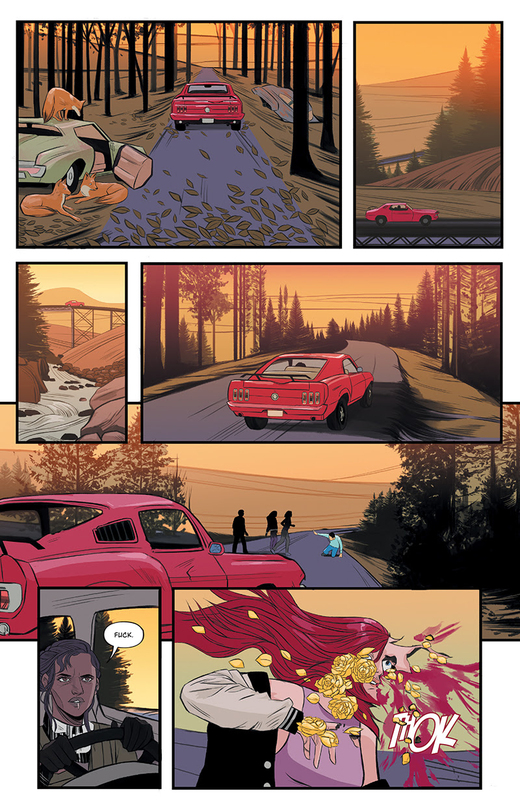 I love drawing women, nature, cars, and I love apocalypse settings. I’m not too picky when I’m looking to work on a comic — as long as the story’s good, I’m hooked, and Vita’s the person you call if you want a good story. Marissa Louise: I don’t remember how I got involved. All I remember was hearing the team and saying yes, then hearing the concept and screaming yes. Vita Ayala: I have been working on a version of this story (which has gone through two name changes) for years now. It was a story that I initially developed in college with a very good friend, and while it is very different from that seed of an idea, many things have spiritually carried over. When Emily and I started talking about working together, she reinvigorated my enthusiasm for the story. When we worked out the specifics of the Abominations — the flower zombies — I knew there was no turning back, I was obsessed. Danny Lore: Vita and I have always bounced ideas back and forth, and I think I’d seen one of the older iterations of this story. Vita has always come up with the kinds of stories I want to see in the world, so I jumped at the chance to participate. The fact that it was a floral apocalypse just cemented my excitement. Natasha Alterici: I had made it a goal of mine to do more cover work this year, and to collaborate and support the projects of less white/cis/het/male teams. So it was perfect timing that Vita reached out to me about doing variants for the series. And when I read over all the materials and saw the amazing art that was done for it already, I knew I wanted to be a part of this smart and beautiful series. Plus, how could I say no to painting flower zombies? I think “flower zombies” is a concept that sells itself, no elevator pitch necessary. But can you tell me a bit about the genesis of the idea, and how the concept developed and changed throughout the process of putting this book together? Pearson: Neither of us can remember for the life of us which one of us came up with the idea of flower zombies. Vita asked if there’s anything I’d be interested in drawing. I mentioned it might be fun to draw mutated people, but I really didn’t think much of it. Vita ended up changing a lot of the story to include mutations. We ended up talking about it for a while, I went through a couple renditions of what the abominations could look like, and eventually we both settled on the current design of these creepy colorful flower zombies. Ayala: It was a sort of chemical reaction between Emily and I. I wanted to know what kind of things she was interested in creating and drawing — I didn’t want her to be miserable for however many months it would be we worked on this. She mentioned she loved drawing nature and cute girls, and that worked well because even in the beginning, nature played a huge role (the secret main character of the book). Figuring out the Abominations was a bit like a jazz jam session. We were in the creative zone, just throwing ideas around, and we ended up making some sweet music! Pundits keep declaring zombies and post-apocalyptic narratives dead, but The Walking Dead shows no signs of slowing down, and new takes on zombies and extreme survival stories keep coming. Why are zombies and social collapse stories so popular right now, in this historical moment? Ayala: I think Monsters with capital “M” are cyclical. They represent very real anxieties and fears that we have, and depending on what is happening in our world at any given moment, these fears can surge to the forefront of our consciousness. I think zombies and that sort of horde-like end of the world scenario speak to very real feelings of not just helplessness and anxiety over global catastrophe, but also to feelings of losing the sense of self. They are a sweet spot of very real concerns about the end of civilization [particularly] our specific way of life as it in the present, and corruption. This genre of story also speaks to people’s need to believe they will survive, against all odds. Sure there may be a literal wave of death coming for me (zombies, plague, nuclear war), but I can make it — I am strong enough, smart enough, and wily enough to beat the odds. Zombies are often metaphors for real viral plagues and government failures with respect to public health. Other times they’re about failures in human character: representative of sin or selfishness. And in very bad zombie stories, they’re just an excuse for our heroes to enact violence on mindless bodies. What are the zombies in The Wilds about — and why flowers? Ayala: To me, the zombies in The Wilds represent a few things. They represent our fears, about the world and about things we cannot control, about what we really are. They also represent the dangers that people — especially marginalized people — face every day, just for existing. Literally walking down the street as a PoC, as a Queer person, as a woman (and all the gods help you if you are all three) is a huge risk, can and does often entail protecting yourself against psychological, emotional or physical violence regularly. The Abominations [or flower zombies] also sort of represent the relentless march of Mother Nature and how it doesn’t care about humanity or our agendas. Ultimately, while we are a very destructive species, we all end up the same as any other in the end, and when we are gone, nature will cover up our bones and the ruins of our buildings right quick. So I guess, they represent both our internal fears of being powerless and consumed, how we enact violence on people who are socially vulnerable, and also how nature scoffs at our pettiness. The post The Apocalypse is Floral in The Wilds, Complete with Flower Zombies appeared first on CBR. Looking for some new kicks? It sounds like Marvel Comics and Vans will be teaming up once again for a line of superhero-inspired shoes. Vans recently put up a Marvel page on their site, including a teaser video featuring Spider-Man in action and a reference to “off the wall” heroes. There’s not much more information to go on at the moment, but an official announcement is sure to follow. This isn’t the first time Vans and Marvel have teamed up. The two companies joined forces back in 2013 for a series of Avengers, Iron Man and Spider-Man themed shoes. The designs were available on a wide range of shoe types, so it’s reasonable to expect the upcoming Marvel footwear will follow suit. Shoes with comic book and video game ties-ins have been popular for some time now. Recently, pairs of Nike PlayStation shoes sold out in a matter of moments after going up for sale. New Balance has also found success with its Black Panther­-themed sneakers, which released on the same day as the film. There’s no telling what kind of footwear Marvel and Vans’ latest collaboration will bear, but with the popularity of Black Panther only increasing and Avengers: Infinity War right around the corner, it seems only natural for the celebratory kicks to go all out. The post Marvel & Vans Tease New Sneaker Collaboration appeared first on CBR. It's not even a problem of scope. Writer Chip Zdarsky introduces a truly world-ending threat as Spidey and his fellow heroes find their own tech wiped out even as an army of Tinkerer-boosted villains swoop in for the kill. That in turn fuels a larger doomsday scenario later in the story. Some might argue this is all too big for a Spider-Man comic, dragging the hero out of his comfort zone to deal with challenges above his pay grade. I don't put much stock in that criticism, as Dan Slott's Spider-Man run has regularly proven that it's possible to push the character in strange, unlikely new directions and still maintain the core of Spider-Man.